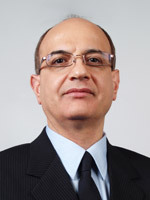 Dr. Asghar Esmaeeli is an expert in large scale computations of multiphase flows. He is one of the key contributors of the immersed boundary technique that was developed in the University of Michigan in early nineties and gained international reputation for its accuracy and robustness in solving complex multiphase flow problems. Dr. Esmaeeli’s research covers a wide range of problems including boiling phenomena, bubbly flows, and electrohydrodynamics. He is a fellow of ASME, an associate fellow of AIAA, and a member of editorial boards of several thermal/fluids journals. A. Esmaeeli. Transient Electrohydrodynamics of a Liquid Drop in AC Electric Fields. European Physical Journal E, 2018, 41, 135. A. Asadollahi and A. Esmaeeli. Simulation of Condensation and Liquid Break-up on a Micro-Object with Upper and Lower Movable Walls Using Lattice Boltzmann Method. Physica A, 2018, 498, 33-49. A. Esmaeeli and M. Abdul Halim. Electrohydrodynamics of a Liquid Drop in AC Electric Fields. Acta Mechanica, 2018, 229, 3943-3962. A. Esmaeeli and M. Abdul Halim. Electrohydrodynamics of a Liquid Jet in Transverse AC Electric Fields. International Journal of Multiphase Flow, 2018, 109, 219-241. A. Esmaeeli and A. Behjatian. A note on the Transient Electrohydrodynamics of a Liquid Drop. Fluid Dynamics and Materials Processing, 2017, 13, 143-153. A. Esmaeeli. Dielectrophoretic- and Electrohydrodynamic-Driven Translational Motion of a Liquid Column in Transverse Electric Fields. Physics of Fluids, 2016, 28, 073306. A. Behjatian and A. Esmaeeli. Equilibrium Shape and Hysteresis Behavior of Liquid Jets in Transvers Electric Fields. Journal of Electrostatics, 2015, 75, 5-13. A. Behjatian and A. Esmaeeli. Transient Electrohydrodynamics of Compound Drops. Acta Mechanica, 2015, 226, 2581-2606. A. Behjatian and A. Esmaeeli. Confinement Effects on Electrohydrodynamics of Two-Dimensional Miscible Liquid Drops. Colloids and Surfaces A: Physicochemical and Engineering Aspects, 2014, 441, 116-126. P. Sharifi and A. Esmaeeli. Comparison of EHD-Driven Instability of Thick and Thin Liquid Films by a Transverse Electric Field. Fluid Dynamics and Materials Processing, 2013, 9, 389-418. A. Behjatian and A. Esmaeeli. Electrohydrodynamics of a Compound Drop. Physical Review E, 2013, 88, 033012. A. Behjatian and A. Esmaeeli. Flow Patterns and Deformation Modes of Coaxial Liquid Columns in Transverse Electric Fields. European Physical Journal E, 2013, 36, 114. M. Abdul Halim and A. Esmaeeli. Computational Studies on the Transient Electrohydrodynamics of a Liquid Drop. Fluid Dynamics and Materials Processing, 2013, 9, 435-460. A. Behjatian and A. Esmaeeli. Electrohydrodynamics of a Liquid Column under a Transverse Electric Field in Confined Domains. International Journal of Multiphase Flow, 2013, 48, 71-81.